The Southern Region Waste Management Office, Limerick local authorities and Security in Shredding wish to offer this unique shredding and recycling service to the public at this special event on 28th January. The Free Shredding event will encourage the public to dispose of their private and personal documents appropriately. Such documents can include bank statements, bills, receipts and identification – all paper-based items that display a name and address. The event will help people understand the importance of destroying and disposing of their confidential data whilst reducing the volume of paper reaching landfill. At Security in Shredding we are aware of the risks people are open to in relation to their personal data. Data Protection concerns and issues are forever present in all of our lives, at work, in the health field, in relations with public authorities, when purchasing goods and services, when travelling or simply surfing the internet. With this in mind Security in Shredding is providing their high security shredding technologies free of charge for the general public and small businesses to avail of and in turn they will receive free information in relation to Data Protection in order to increase awareness and decrease cases of data breaches and identity theft. 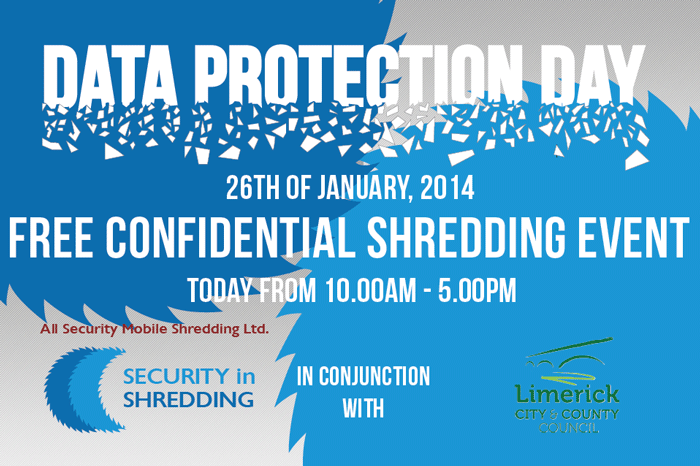 The aim of this “Free Confidential Shredding Event” on Data Protection Day is to provide members of the general public and employers within small businesses with an expert professional service free of charge in addition to receiving information to help understand what personal data is collected and processed and what their rights are with respect to this processing. In addition to highlighting high risks of data breaches in hard paper form from a household and a business, for example this could be simply disposing of waste paper containing confidential information in a recycling bin to enter the recycling process directly and not being destroyed appropriately first. At the “Free Shredding Event”, Security in Shredding whom are experts in their field, will be providing this high quality, efficient, on-site and extremely secure shredding service to the public completely free of charge. Representatives from the company will be on-site to provide information regarding Data Protection and Data Protection Day. So all the public have to do is bring along their confidential paper waste (up to a maximum of 2 refuse sacks per person) to the Mungret Recycling Centre on Tuesday January 28th. The centre is open from 10am to 5pm with last entry at 4.45pm. There will be no charge for security shredding at this event. It is hoped the event will raise awareness about the importance of data protection, disposal and recycling. When you give your personal details to an organisation or individual, they have a duty to keep these details private and safe. This process is known as data protection. Organisations or individuals who control the contents and use of your personal details are known as ‘data controllers’. Under data protection law, you have rights regarding the use of personal details (Data) and data controllers have certain responsibilities in how they handle this information. When do these rights apply? Made up of photographs or video recordings of your image or recordings of your voice. This entry was posted in Confidential Shredding by Security in Shredding. Bookmark the permalink.